The hotel is an architectural marvel, boasting aesthetically designed rooms, executive suites & cottages featuring modern amenities, contemporary design and décor amidst peaceful & serene surroundings. 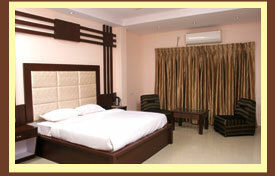 All rooms are spacious and tastefully decorated, designed, furnished & equipped to meet the discerning guests' needs. 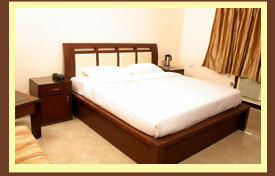 The rooms present a sense of luxurious comfort and residential warmth to its dweller. It beautifully blends luxury with comfort giving the travelers an ease to relax after a hectic day of sightseeing or business meetings. Deluxe rooms deliver a statement that is stylish and functional. Executive rooms deliver the aura of a rich contemporary environment. Booking confirmation is subject to receipt of full advance amount from guest/their representative travel agent or tour operator. If Arrival is not mentioned the reservation will be released at 18:00 hrs. No retention chargeable for cancellation made at least a prior 10 days to arrival date and time. For cancellation between 3 to 9 days – 50% of the total package. For Guests where payments are to be made by the company, the hotel reserves the right to charge one night retention in case of No-show. If the room will not be available in our hotel premises for any reason, the management reserves the right to provide the alternative arrangement. All disputes to Haridwar jurisdiction only.